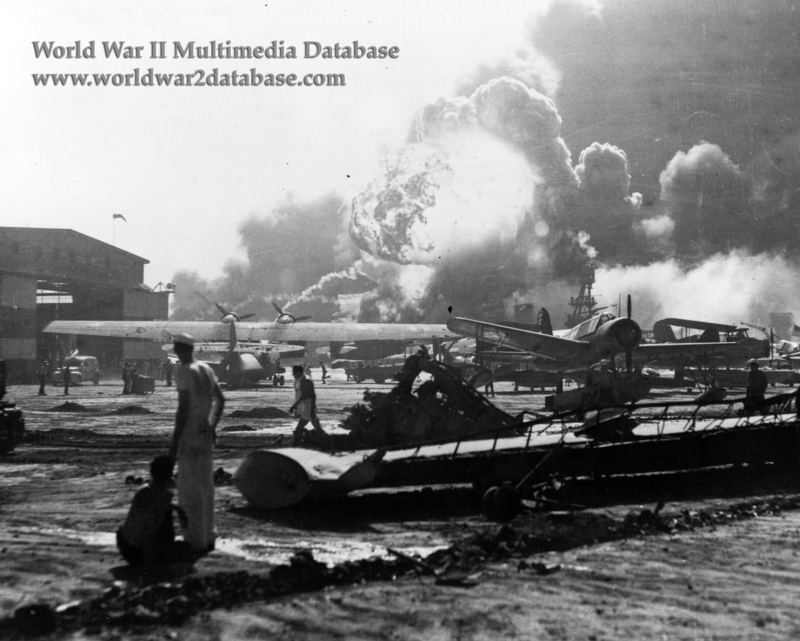 Sailors stand amid wrecked planes near Hangar 6 at the Ford Island seaplane base, watching as USS Shaw's (DD-373) magazine explodes in the center background. The grounded USS Nevada (BB-36) is also visible in the middle background, with her bow headed toward the left. As Nevada attempted to sortie down the channel, she was attacked by Japanese Aichi D3A Type 97 dive bombers. Their bombs hit Shaw instead; twenty minutes later, fires reached the destroyer's ammunition magazine and she blew up, severing the ship forward. Planes present include Consolidated PBY-5A Catalina, Chance-Vought OS2U Kingfisher and Curtiss SOC Seagull types. Wrecked wing in the foreground is from a PBY. Some versions of this photo released for the press blacked out the sailor sitting on the ground.